Bring your splash resistant travel companion everywhere you go! Whether you're fishing by the lake, relaxing at the beach, or taking a shower you can play your favorite tunes without getting your mp3 player wet. This splash proof device gives you the security of having your iPod play music from inside the locking, watertight compartment. 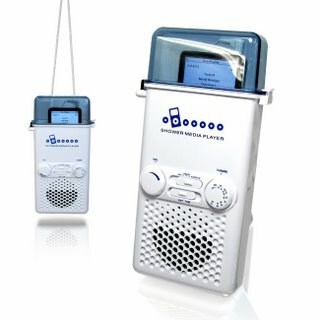 The Shower Media Player isn't just limited to your iPod music, you can also tune into your favorite radio stations with the built in AM/FM radio. With the Shower Media Player you can convert your typical A Capella shower performances into an enjoyable karaoke experience.